This nautical themed waterfront condo is the perfect combination of at-home comfort and vacation getaway. 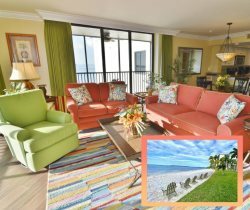 Enjoy nightly sunsets from your furnished, screened in balcony overlooking Sanibel and Florida's barrier islands, and relax within a bright and open concept floor plan with tray ceilings, crown molding and plantation shutters. This spacious condo also features stainless steel appliances, corian and quartz counter tops and a separate laundry room. In the master bedroom, two people can watch the waves from a king size Sleep Number bed. With two twin beds in the guest bedroom and a sofa sleeper in the living room, this unit can accommodate 6 people in total.